If you’re planning to buy an aluminum ladder, and especially if this is your first time, there are a few points that you should bear in mind so that you end up buying the right ladder based on your exact need. If you buy in a hurry without putting much thought into it, chances are that you’ll end up buying a wrong one. Buying the right aluminum ladder is the safest option. Using the wrong ladder can be extremely risky as it may result in serious injury. To get an idea as to which ladder will suit your needs best just think about all of the tasks you intend to perform with it. 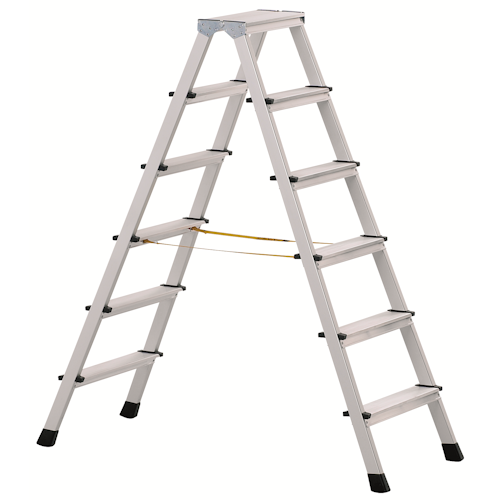 Different types of ladders are available in the market to perform different tasks. There are size, weight, ratings, material, & extension options available for you to choose from. Before you finalize the product and place an order for it ask yourself and others who’re going to use it the following questions. The first step in ladder selection is choosing the right style of ladder that’ll keep you safe when you climb or stand on it. Using the wrong style of ladder or ignoring the limitations can result in a fall and may lead to injury. When you are buying aluminum ladder, one thing is certain, you want to climb on it and work on heights. Keep this basic technique or formula to ensure safety. The highest permitted level where you can stand and work on a stepladder is to leave two steps from the top and then stand. If you stand at the top or one level down you might lose balance and fall. Safest and optimum height that a user can use ladder for is around 4' higher than the height of the ladder. If you keep this point in mind, you will buy a ladder that will take your weight and help you perform your tasks safety by climbing on it. Similarly if you ought to go for extendable aluminum ladder, they have to be 7 to 10 feet longer than the highest support point that could either be the wall or roof. The highest level at which one is allowed to climb and perform tasks is four steps down from the top. If you keep these two points in mind, it will help you to make a better decision.